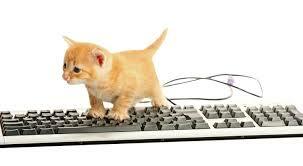 Here’s a kitty on a keyboard, for no particular reason whatsover. This post is completely my own idea, and nothing to do with shadowy certification authorities that reward blog posts about online security with continuing education credits. Probably. Maybe. Ok. That’s actually why… Still. 1) Account Compartmentalization- When establishing new accounts and passwords, group by function. Every account that will be used for payments requires a strong unique password, and preferably unique user name. Also avoid leaving payment information on their server, if possible. For essential recurring payments, set aside a specific account or card. Don’t use this card for whimsical purchases. You can make whimsical purchases. (Believe me, I do.) Just use a different card, username and password. This way if something’s compromised, you can hopefully still pay your gas, electric and internet bill. You know, the essential utilities. 3) Review and Renew- Old websites are constantly being compromised. New security tools become available. Don’t be complacent. Keep up-to-date on security breaches at major retailers and online publications. Read your bank statements. Sign-up for email security alerts. Check your credit. Think about adding Google Two-part authentication, or some other new security tool. You know, all the fun things in life. Periodically, make a point of flushing out your online commercial identity. Get new cards. Purge old account names and passwords. You can keep your twitter username, but does it really matter what you use for your bank username? Change your security questions. Just because the bank says to use your mother’s maiden name, doesn’t mean you can’t answer that with your favorite cookie flavor. Mix things up a bit. Create your own security verification system, rather than relying on theirs. That’s the basics. If you follow all of these, your chance of online grief will be lowered. It will never, however, ever be eliminated. I’m a firm believer in the maxim that no security is ever foolproof. Sometimes, the best you can do is try to stay ahead of the other guy running away from the bear.